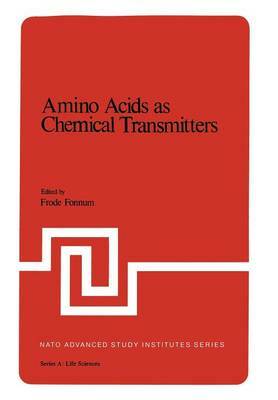 This volume represents the proceedings of a NATO Advanced Study Institute on Amino Acids as Chemical Transmitters, which took ~lace at Spatind Hotel in Norway, August 14-21, 1977. The meeting is related to two previous meetings on metabolic compart- mentation in the brain. The first of these meetings took place at Rockefeller Foundation, Bellagio, Italy, July 11-16, 1971 and the proceedings, Metabolic Compartmentation in Brain, were edited by R. Balazs and J. E. Cremer and published by Macmillan in 1973. The second meeting was an Advanced Study Institute on Metabolic Com- partmentation and Neurotransmission Relation to Brain Structure and Function, which was held in Oxford, September 1-8, 1974. The proceedings were edited by S. Berl, D. D. Clarke and D. Schneider and published as Volume 6 of the NATO ASI Life Science series by Plenum Press. The object of the present meeting was to review and discuss the present status of amino acids as chemical transmitters. Several issues such as electrophysiological response, localization, synthe- sis, release and receptor binding of transmitter candidates were discussed. The possible morphological correlates to these func- tions were also reviewed. During the meeting 24 leading papers were given. In addition, several of the participants presented important new findings during the discussion. Some of these have been included as short reports. The main financial support was obtained from NATO, Scientific Affairs Division.